Hold Your Mugs Together By Using The Mug Hooks!when Your Friends Come To Your House,Will Be Deeply Attracted By This Cup Holder,Your Coffee Table Without Watermarks,Clean And Tidy, Easy Access To The Cup,The Cup Holder Drain Dry And The Cup Remains Crystal Clear,Cup Rabbet Clean Wiout Any Mark,Let You Chat With Your Friends To Enjoy A Comfortable day! High-end Quality,Use Of Advanced Plastic Materials With Integrated Design,Resistant To Rust,Non-slip,Durable.oil-resistant,Very Easy To clean. 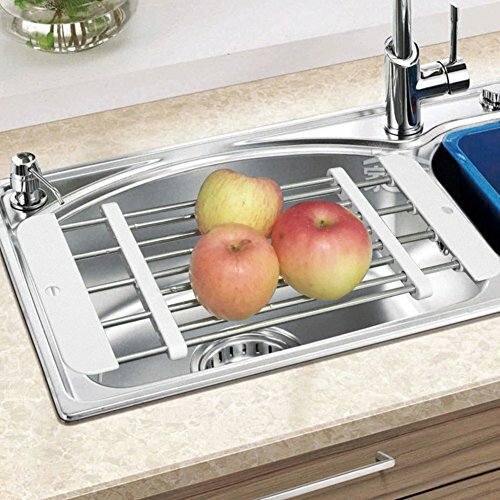 Excellent Space-saver Multi-purpose Heavy-duty Over The Sink Dish Drainer,Not Only Does It Provide Remarkably Simple Efficient Solutions To Air-dry Washed Bowls,Pot,Fry Pans,Tableware,Cookware,Cutlery And Kitchen Utensil Gadgets,But Also Can Be Used As Vegetable Colander And Prep Works Platform Over The Sink. Wider And Larger - Fits Over Sink Or On Countertop,Offers You More Usable Working room. Our Price To Provide The Best Quality,Worry-free After Sale,Healthy And Environmentally Friendly,Welcome To compare! If you have any questions about this product by DGJDSLGDGBLDFHFDH, contact us by completing and submitting the form below. If you are looking for a specif part number, please include it with your message.